Galerie Nathalie Obadia is thrilled to present, The Game of Life, the third solo exhibition by the american artist, Brenna Youngblood, following on from the exhibitions held in Brussels in 2013 and in Paris in 2015. Born in 1979 in Riverside, California, the young afro-american artist has been living and working in Los Angeles since 2006. Today, Brenna Youngblood is one of the most prominent artists on the US emerging artist scene. Over the past ten years, several institutional exhibition have been organised in her honour including three recent monographic exhibitions: Abstracted Realities at the Seattle Art Museum, Washington, and Project series 50: Brenna Youngblood at the Pomona College Museum of Art in Claremont, California, in 2015; and Brenna Youngblood: Loss Prevention at the Contemporary Art Museum in Saint Louis, Missouri, in 2014. With her new exhibition, The Game of Life, Brenna Youngblood presents around fifteen previously unseen paintings linked to her daily life and urban surroundings. The artist is able to capture the pulse of the city and her paintings vibrate with the rhythm of the ‘City of Angels’. Her work clearly shows the contrast between the two faces of Los Angeles, the glamorous Hollywood side and the trashy South Downtown, an area which was made famous through films, hip hop culture and gangsta rap. Brenna Youngblood gathers different elements in her work just like a city gathers populations of various social and cultural origins. From this mix, the artist sources the inspiration and force which characterise her work. 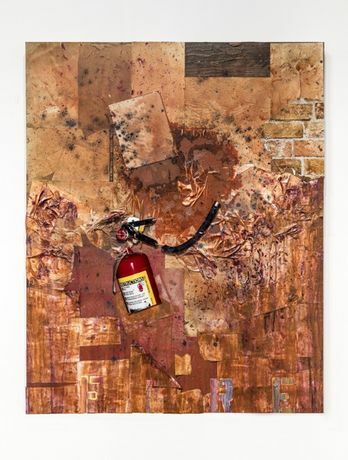 She recycles and sticks different materials such as wallpaper, ribbon, cardboard, material or linoleum with fake wood and brick on the painted canvas. This forms an original blend which reminds us of the famous ‘combine paintings’ by Robert Rauschenberg (1925-2008, United Kingdom). Another example of the Neo-Dada and Pop Art influence can be seen in Brenna Youngblood’s work when she inserts manufactured elements like printed letters into the compositions. Just like David Hammons (born in 1943 in Springfield, United States), a leading figure of the afro-american art scene, she creates work using puzzles. Brenna Youngblood steers away from figuration and moves towards conceptual art by choosing objects in a precise context. The heterogeneous elements fixed upon the canvas disappear within the painting adding an abstract side to Brenna Youngblood’s work. The artist effectively hides certain details to consequently bring attention to them. She even cuts and rips the surface of the paintings to unravel different layers. Just like an archaeologist discovers parts of the past, one can become immersed into the painting and discover deeper motifs, colours, textures and materials. In an honest manner, Brenna Youngblood leaves the traces of her paintbrush, conscious to maintain transparency. Brenna Youngblood applies paint with stains, colours and filling, sometimes the three methods at once in order to create various painting textures. When the canvas or paper is covered in pigment she says that her paintings “reacts like the skin of an old person”. This organic image reflects the rugged surface of Brenna Youngblood’s paintings which appear to be worn down by the sun and wind. They provoke a deep and primitive emotion, like the American Great West with its abrupt deserts. Her paintings reflect the atmosphere of the rural scenes by David Hockney (born in 1937 in Bradford, United Kingdom). Thanks to her talent and her investment in the world, Brenna Youngblood’s artistic references are integrated and expressed in a subtle way. She is perpetually inspired by the world around and her daily life. This is where she sources material which she recycles and where she finds ideas to express her street-life culture. This indeed is where the virility and the harsh reality of paintings comes from.